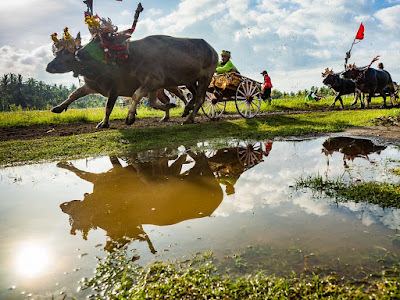 Buffalo racers pass a puddle during buffalo racing in Jembrana, Bali. We are in Bali to photograph buffalo racing in Jembrana, on the far west end of Bali. Hook a pair of buffalo bulls up to a small cart, put a driver in the cart and watch them careen down dirt roads that wind through rice fields. That's pretty much all there is to it. Racers on the muddy straight away. The road is too narrow for the competitors to race side by side, so they run in tandem and are timed with stopwatches. 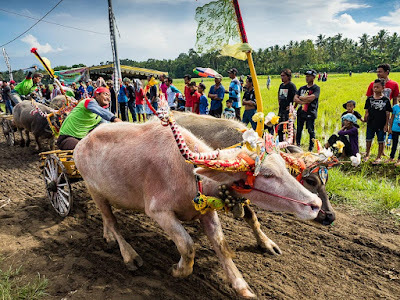 The buffalo races are one of Bali's signature events, but the location, hours from the tourist centers in Kuta and Ubud, means that relatively few tourists go to the races. 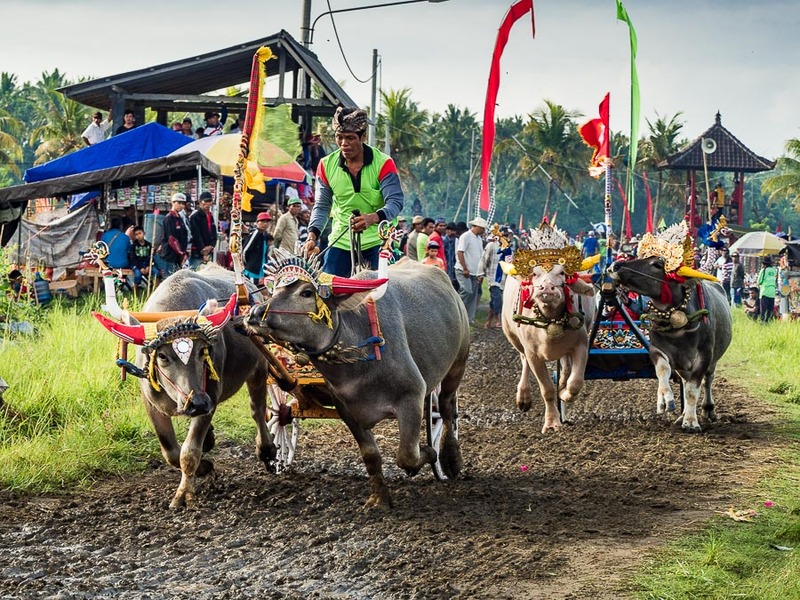 There were hundreds, maybe thousands, of Balinese at the races we went to. There were fewer than 10 foreign tourists. We pretty much had the races to ourselves. Members of a race team haul the cart (with yoke attached) to the starting line. 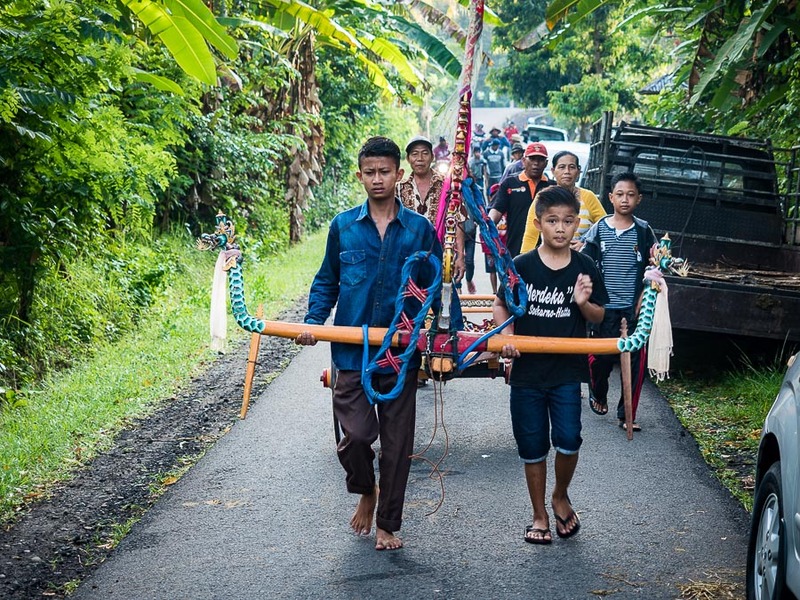 The carts are pretty small, about twice the size of an American child's little red wagon, with bamboo floor and wooden spoked wheels. The buffalo are medium sized, probably adolescent (I'm not a buffalo expert). The drivers, always men, sometimes sit but usually stand in the cart flogging the buff with spiked sticks. 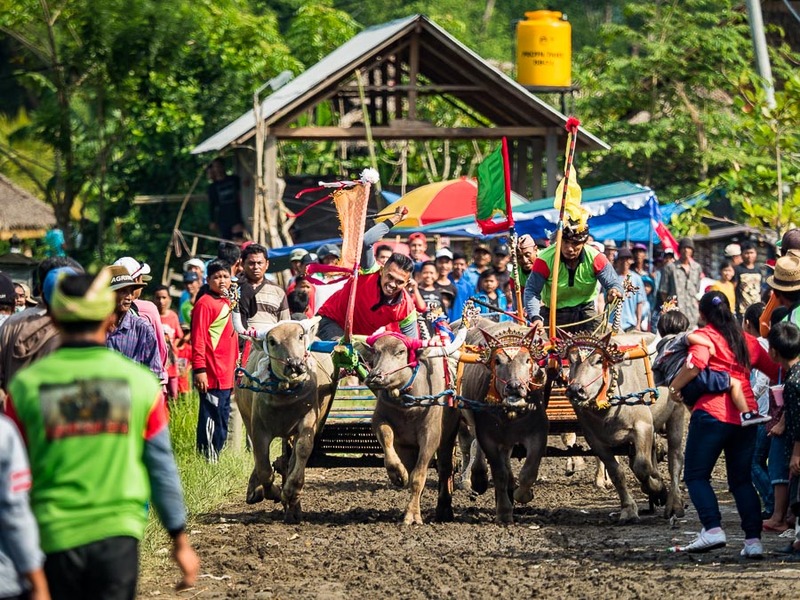 The buffalo are decorated with colorful banners and bells. 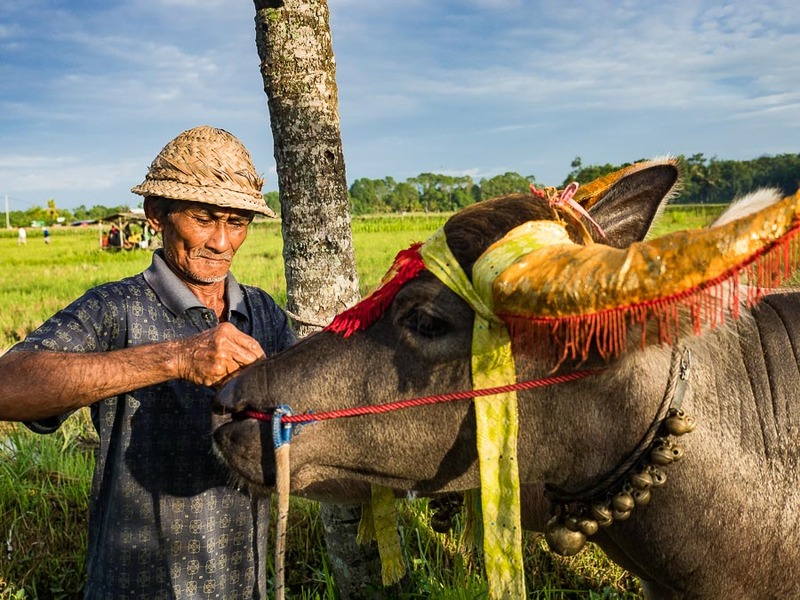 A farmer gets his buffalo ready to race. The track is not closed during the race. Spectators and community residents wander along the side of the road, carefully looking both ways before running across the road. The crowd at the finish line pushes well into the course, making it part demolition derby part race. I was a little surprised no one got hit or hurt. A pair of racers break for the finish line while a woman carries her son up the track. This is normal. Crossing the finish line, just a few feet from where I was standing. The buffalo races in Jembrana are a seasonal event. They usually start in July, the last race of the season is usually in October. Races are normally held every two weeks, but may be postponed because of weather. The location changes from week to week. There are more pictures of the buffalo racing in my archive or available from ZUMA Press.